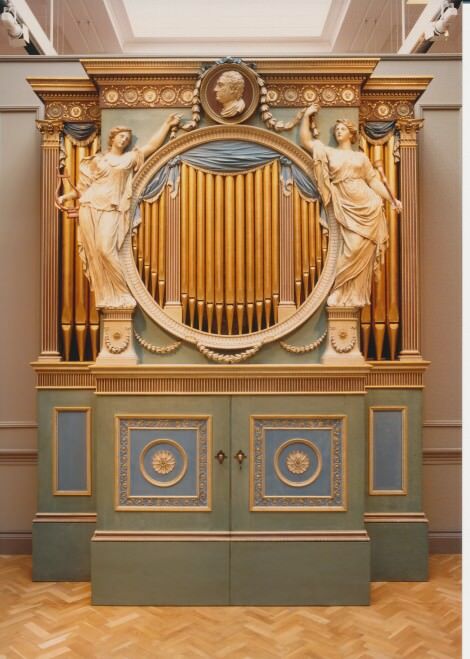 The organ was made by Snetzler (S) in 1774 for Sir Watkin Williams Wynn, “the Welsh Maecenas” for his London house at 20, St James’s Square. It was already somewhat altered by Samuel Green (G) in 1783. The organ was moved to the Williams Wynn country seat at Wynnstay Hall near Ruabon in 1863, and rebuilt by Gray & Davison (G&D). The Organ was restored by G&G in 1996, more or less unaltered, though the Swell, which at Wynnstay had been placed in an alcove behind the organ was placed in the normal position in the more compact form necessary in the Museum. For the Museum Oliver Fairclough was instrumental in the purchase of the organ and guided its installation. There are regular Thursday lunchtime concerts organised by Cardiff Organ Events. The mixtures are made up of pipes marked , and ; these are from the Great Twelfth, Sesquialtra and Cornet and the Swell Cornet. The Swell Mixture and Fifteenth go down to C. The Bourdon uses some Snetzler GG and AA pipes. The Swell Double and Stopped Diapasons are entirely made G&D pipework. Voicing; G&D’s voicing is undisturbed, and Snetzler’s is more or less intact too. The wind pressure is 2 1/4″ (58mm) which cannot be far from Snetzler’s. The main alteration to Snetzler’s tonal scheme is to the composition of the mixtures, and the volume balance. Pitch: A440. Tuning is equal temperament.